No rest for the brave ! The format was the same than the previous year, with fourteen invited players and two qualifier spots making up the knock-out brackets. The formula was also identical, although cleared of the chess960 games which didn’t make much sense. As for the rythm, it was still featuring 90 minutes of 5/1 blitz, 60 minutes of 3/1 blitz, and 30 minutes of 1/1 bullet chess. Just arrived home, Maxime played some training games online with IM Minh Le, a Vietnamese player with high blitz reputation, mainly in bullet. 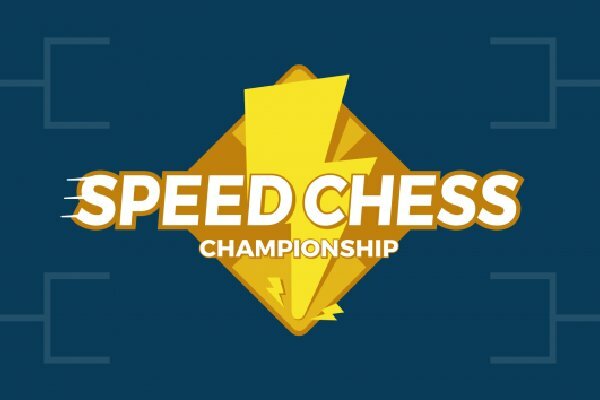 And at 9pm, he was sill in front of his computer, ready to face his 1/8 finals opponent, Leinier Dominguez from Cuba, a player not to be underestimated as he was once World Blitz Champion, back in 2008! Here are a few highlights of this online match, whose 3-hour of play meant 31 games. The 5/1 segment was quite even in terms of play, even if Maxime took a two-point lead. Dominguez-Mvl, Game 4; on the theme of the trapped Rook. The fact remains that in the diagrammed position, 29.c5! guaranteed an easier draw, for instance 29…Rd5 30.cxb6 Rxb5 31.axb5 cxb6 32.Kd3. 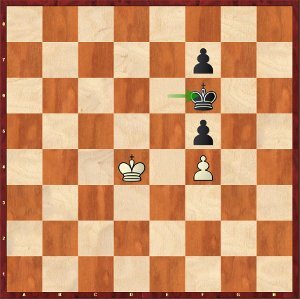 Dominguez-Mvl, Game 6; Rook endings are always drawn! After an epic tactical slugfest during which he was on the ropes, Maxime got a difficult Rook ending, which could have been concluded by white after 50.Kb4. Instead, Dominguez chose the intuitive 50.Ka2?, trying to win by force with his b pawn, without allowing the black Rook behind it. An idea which worked perfectly after 50…Rc1? 51.b6 Rxc4 52.b7 Rb4 53.Rb2! Rxb7 54.Rxb7+ Ke6 55.Kb3 and white’s King is back in time. However, after 50.Ka2?, black had the opportunity to take advantage of the King’s remoteness and to use its own f pawn; 50…f4!, with the idea 51.b6 Rg1 52.b7 Rg8 53.c5 f3!, and against any move, black will play …f2 /Rxf2 Kd7(d6) blocking white’s pawns with the King! For example 54.Kb3 f2! 55.Rxf2 Kd7 56.Rxf7+ Kc6, or 54.c6 f2! 55.Rxf2 Kd6. But to find this line at the end of a blitz game ? Inhuman ! Despite three wins in a row, Maxime ran out of steam at the end of this 3/1 segment, allowing the Cuban back to striking distance, only one game behind before the bullet segment. 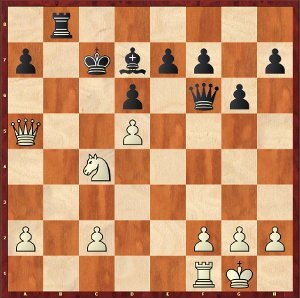 In a further high-wire tactical display, the Cuban’s King joined the attack, a fearless initiative which turned out to be too risky; after46…Qg8+! 47.Kf6 (47.Ke8? 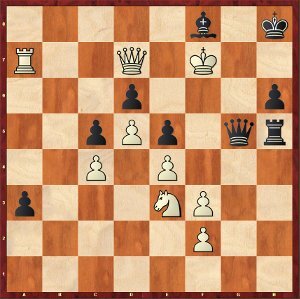 Bg7+ 48.Ke7 Qf8+ 49.Ke6 Qf6 #), black had the choice between a perpetual with 47…Qg5+, or 47…Rg5! 48.Qf7 (only move) 48…Qxf7 49.Rxf7 Bg7+ 50.Ke6 Rg6+ 51.Kf5 Kh7, keeping the edge. 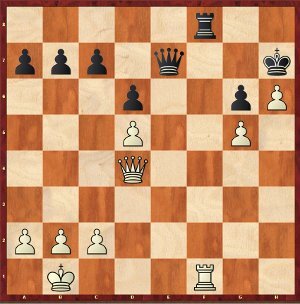 Unfortunately, Maxime chose 46…Qg7+? in the diagrammed position, and after 47.Ke8 Qxd7+ 48.Kxd7, lost this ending with his miserable Bishop on f8. Mvl-Dominguez, Game 13; once again a drawn Rook endgame? 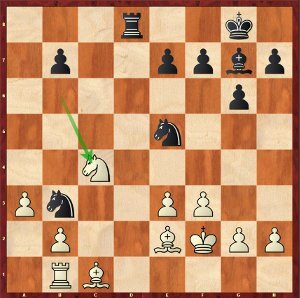 You just don’t see what white could have come up with after the passive defense 42…Rf7 43.Rc6 Re7. But Dominguez chose activity, and the ending is no more drawn after 42…Rd5? 43.Rc6! (maybe the Cuban only expected 43.Rxc7?) 43…Rxb5 44.Rxe6 Rxb4+ 45.Kd5, because if indeed black has managed to restore material balance, he’s just dead lost anyway! 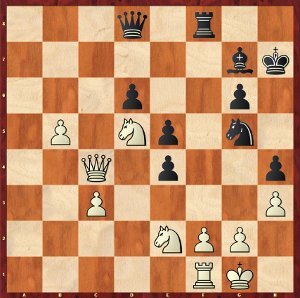 Mvl-Dominguez, Game 17; where does the black King go? 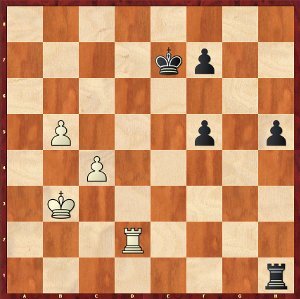 Dominguez opted for c8, and quickly went down after 22…Kc8? 23.Qxa7 Rb7 24.Qa8+ Rb8 25.Nb6+! 1-0 because of a nice fork to follow on d7. He had to hide his King on the corner by 22…Kb7 23.Rb1+ Ka8, and the threat of a back rank mate on a1 prevents white from delivering a decisive combination. Dominguez-Mvl, Game 18; 29…Rf3! ?, an ingenious, but insufficient defensive try..
Maxime knew that in the bullet segment, he would be clear favourite, and indeed he overpowered the Cuban, leading to an overall match victory 19-12. Dominguez-Mvl, Game 24; once again a Rook is trapped! 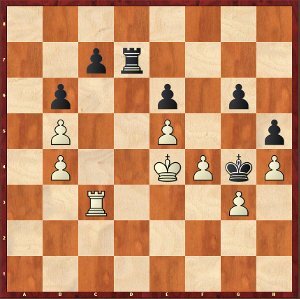 This kind of things sometimes happen in those extreme rythms of play… Instead of remaining a pawn up with the advantage after 29.Rg1, Dominguez chose a Queen ending (29.Rxf8?? ), that doesn’t exist ! (29…Qe1+). 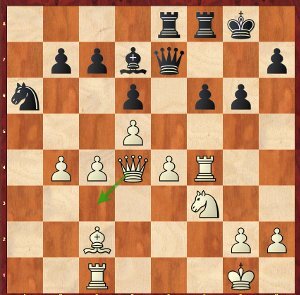 Dominguez-Mvl, Game 30; Maxime now traps a Bishop! In a slightly superior position, white just retreated the Knight from b6. Maxime instantly found the flaw… 23…Rc8! 24.Nxe5 Bxe5 and the Bc1 is trapped and lost! In a high-quality match on the whole, the 31st and last bullet game happened to be the only one filled with spectacular mistakes. Mvl-Dominguez, Game 31; when tiredness takes its toll. Here, Maxime missed 29.Qc3+ followed by 30.Qxc6, which was the simplest way to end the game right away. After further ups and downs, black emerged with an endgame up two pawns. After a move like 53…Ke6, the position is technically winning for black. 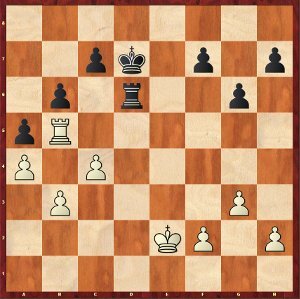 But Dominguez played 53…Rb3?, completely forgetting the fork 54.Rxb6+! Rxb6 55.Nd5+ Ke6 56.Nxb6, and the Knight endgame is drawn. The position has now transposed into a pawn endgame, which is still a draw. 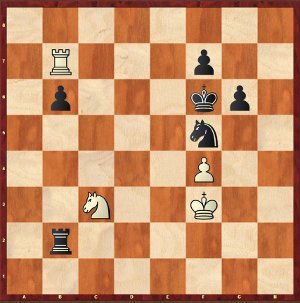 But corresponding squares are impossible to determine without thinking time, and the players made several mistakes: 62.Kd5? (only 62.Ke3! was drawing) 62…Kg6? (the triangulation 62…Kg7! 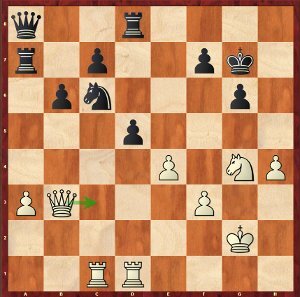 63.Ke5 Kg6 was winning, because of the outflanking by h5-g4. And if 63.Kd4 Kh6 64.Ke3 Kh5 65.Kf3 Kh4 outflanks again) 63.Ke5 Kg7 64.Kxf5 Kf8 65.Kf6 Ke8 66.Kg7 Ke7? (66…f5! 67.Kf6 Kf8 68.Kxf5 Kf7 was, as it happens, a trivial draw!) 67.f5! Ke8 68.f6 1-0. It’s the Cuban who erred once too often! 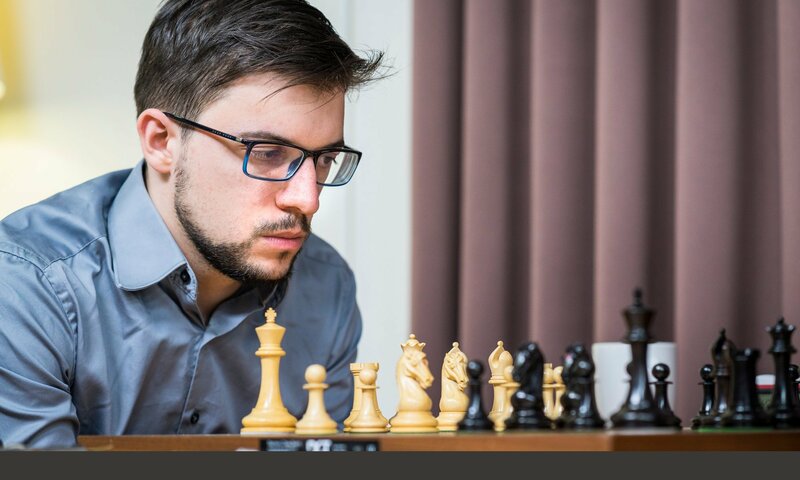 In quarter finals, to take place next september or october, Maxime will play against the circuit bully, American Nakamura, who eliminated him last year, and who just heavily crushed Woman #1 Hou Yifan in the first round, 27.5-2.5! Transatlantic flight This year, Maxime decided to travel to Saint-Louis (Missouri) via New-York. But the journey went tough, because of a large delay of the Paris-New York flight. Maxime will have spent eleven hours flying, notwithstanding the extra hours of waiting in both Charles de Gaulle and Newark airports! Thankfully, by arriving in Saint-Louis a mere two and a half days before the beginning of the games, he earned enough time to digest this long travelling day, as well as the 7-hour time difference. Next PostNext Long live blitz!